Sheffield Renewables is all about working together to make a difference. We are proud of our city. We enjoy living and working here. However we don’t want our lifestyles to cost the earth. We want Sheffield to be a forward thinking place and we’re doing our bit. We are concerned about the impacts of climate change and the risks of fossil fuel depletion. In responding to these challenges, we see opportunities for building a fairer and more inclusive society. We believe that working together and taking the initiative about things that matter can make life more rewarding, exciting and fun. You may already have noticed that change is in the air. All sorts is happening; whether it is to do with transport, buildings, energy, food or lifestyles. Some changes are small, others are big – but together they add to a growing momentum, driving Sheffield towards a low carbon future. There are many ways for us all to play our part. 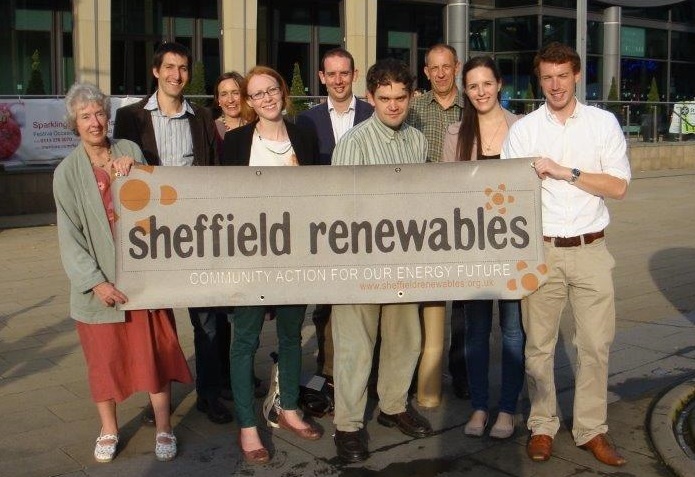 Getting involved with Sheffield Renewables as a volunteer, supporter or and investor are just some of them. We have a strong volunteer ethos. We benefit enormously from the enthusiasm, commitment, skills and experience of our volunteers. In return we offer interesting, challenging and rewarding opportunities for local people with different backgrounds, abilities and experience. Sheffield Renewables is a social enterprise. This means that we operate as a business but any surplus earnings are re-invested to support new work as well as benefiting people and communities in Sheffield. We are a registered society under the Co-operative and Community Benefit Societies Act 2014. This status enables us to finance our work by selling shares, primarily to people and businesses within Sheffield. For more information regarding activites and developments to date, see our Trading History page.